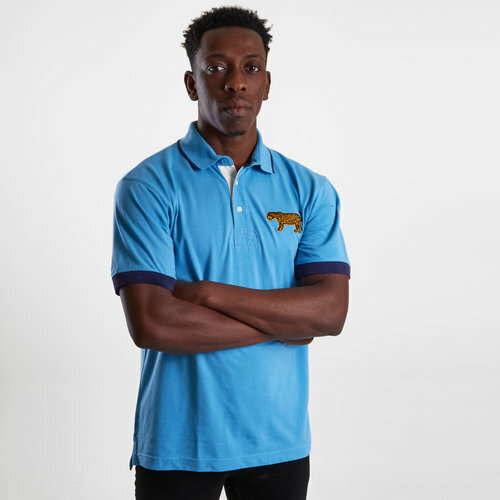 Show your passion and pride for the jaguar with this Argentina 2019/20 Vintage Rugby Polo Shirt from VX-3. The international rugby team Argentina are ranked 9th in the world by the IRB As of 12 July 2017, making them the highest-ranked nation in the Americas. They have competed at every Rugby World Cup staged since the first tournament of 1987, and the country are considered the strongest within the Americas, being undefeated against all but Canada, against whom they have suffered three losses. The classic blue look needs no introduction and is joined by navy around the collar and sleeve cuffs. The Argentine jaguar is stitched aside the buttoned neckline with the word Argentina stitched under the collar at the back. Cheer on Argentina at the 2019 Rugby World Cup with this polo.